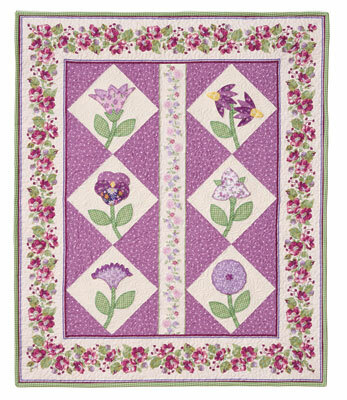 Grow a flower garden in beautiful fabrics to grace your bed or wall as Eleanor Burns presents Magic Vine. 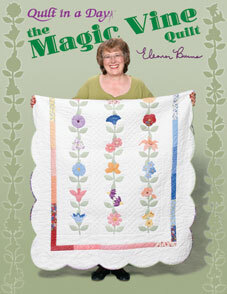 The patterns for Magic Vine originated in the 1930's in a newspaper quilt column written by Florence LaGanke Harris. As part of a series, LaGanke presented one new pattern each week. In addition to the pattern, the reader was treated to a fictitious story about a quilt group and their leader, Nancy Page. In the group, they shared stories, and decided on what colors to use for their flowers. 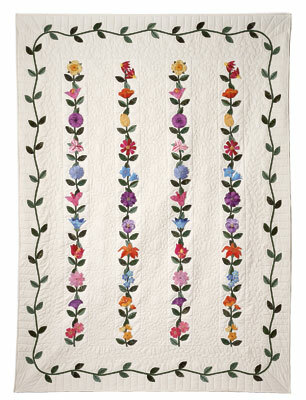 Twenty-two flowers are appliqued in rows with twinning vines. It is magical because of the variety of flowers that grow on the vine. The vine grows quickly, like the magic vine in Jack and the Beanstalk. Whimsical flowers and leaves are easily made, using light-weight paper backed adhesive or the quick turn method using non-woven fusible interfacing. The outside edges are finished with a variety of techniques: satin stitch, blanket stitch, blind hem stitch, and hand applique. Give Magic Vine a traditional 1930's look using reproduction fabrics or bright and contemporary with vibrant colors. 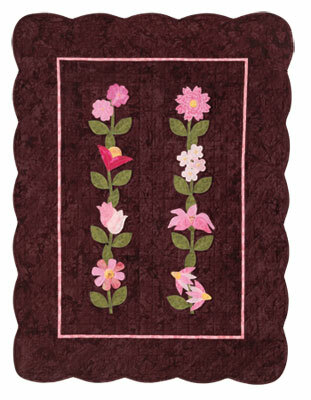 Enjoy embellishing the flowers with hand or machine stitches, beads, and crystals. Eleanor offers assistance on fabric selection and yardage and cutting charts for all five quilt sizes. Bonus projects are included. The book is conveniently bound in wire-o to lay flat.